Sitting directly across the street to the east of 108 Chambers Street, another new residential project is changing the landscape of Tribeca. 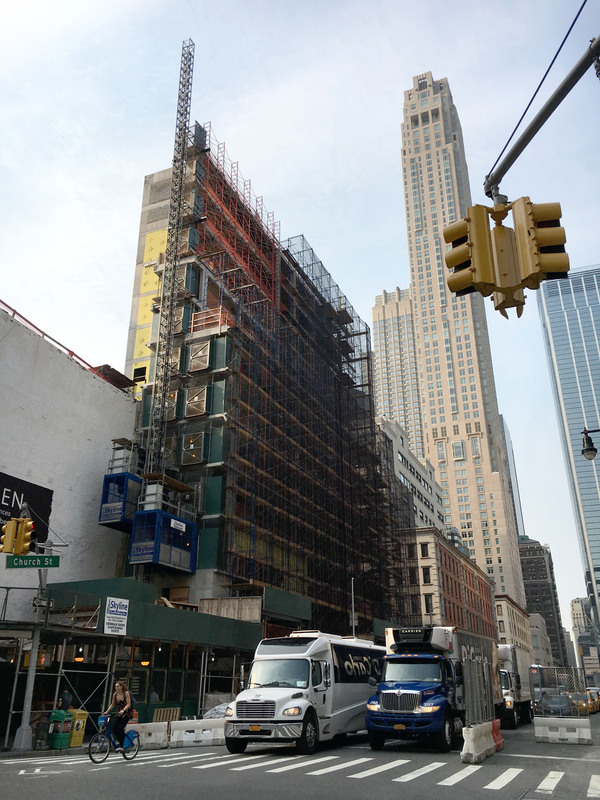 Located between Warren Street and Chambers, the 12-story 30 Warren Street has already-topped out, and is currently blanketed in a web of scaffolding and black construction netting. The building is being designed by Post-Office Architects (POA), while HTO Architects serves as the executive architect. Cape Advisors is developing, the same group behind 75 West Broadway just down the block to the west. 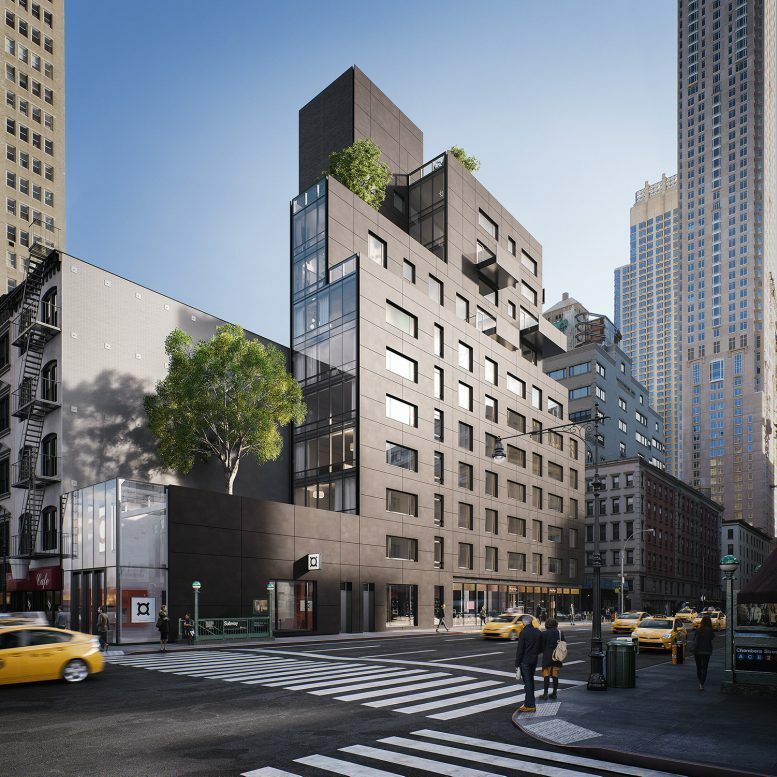 What will make the nearly 50,400 square foot building architecturally distinctive and aesthetically eye-catching is the dark charcoal colored facade that will soon cover all sides. An array of large and small square and rectangular windows also puncture the envelope in an organized grid of partitions along Church Street. The exterior features a custom-ribbed Ductal-colored concrete facade, assembled as thin, multiple modular slabs. Multiple setbacks on several levels of the building make way for several outdoor balconies and landscaped terraces, especially on the north side of the project, which will have the main garden and outdoor terrace. 23 units, starting around $1.99 million and rising to nearly $7.4, will have plentiful exposure to daylight and great views of the World Trade Center and the surrounding neighborhood, averaging around three homes per floor. Inside each space, designed by Line Fontana, ceiling heights range from 9 1/2 foot to 10-feet, while white oak flooring is laid throughout. Luceplan light fixtures and custom cabinetry from local Hudson Valley craftsman will be included, adding a touch that compliments hand-polished brass door hardware and clean finishes to the walls and ceilings. Sound-proof over-sized windows will be made by Schuco. Kitchens will all have Miele appliances, Tundra Gray marble countertops, saddle leather and brass detailing, and oak cabinets coming in light brown and hand-polished white lacquer with fluted glass. Bathrooms will also have Tundra Gray marble slabs and be finished in Sky White marble floors and signature oak frame or white lacquer cabinetry. 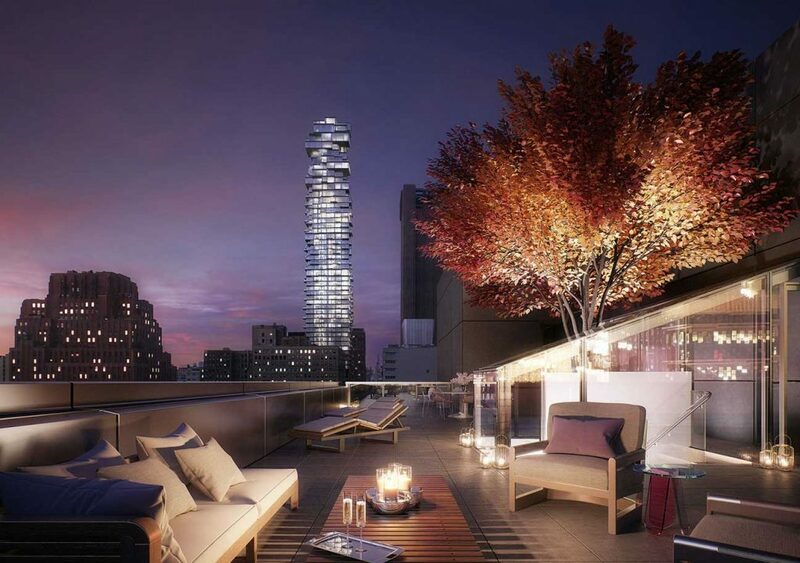 The full floor penthouse will have have around 10 1/2 foot ceilings with 360 degree views of the surrounding district with its own private elevator and rooftop terrace for entertaining and leisure. Sales are being led by Corcoran Sunshine Marketing Group. Amenities for 30 Warren Street include a private entrance for residents with a dark stone slab lobby, including hand-finished oak paneling, custom brass lighting, and the same Ductal slabs seen on the exterior facade continuing into the building. There will be a fitness center and wellness studio, a children’s playroom, valet parking, private and bicycle storage and the outdoor landscaped terrace. Completion of 30 Warren Street is most likely in the first half of 2019. 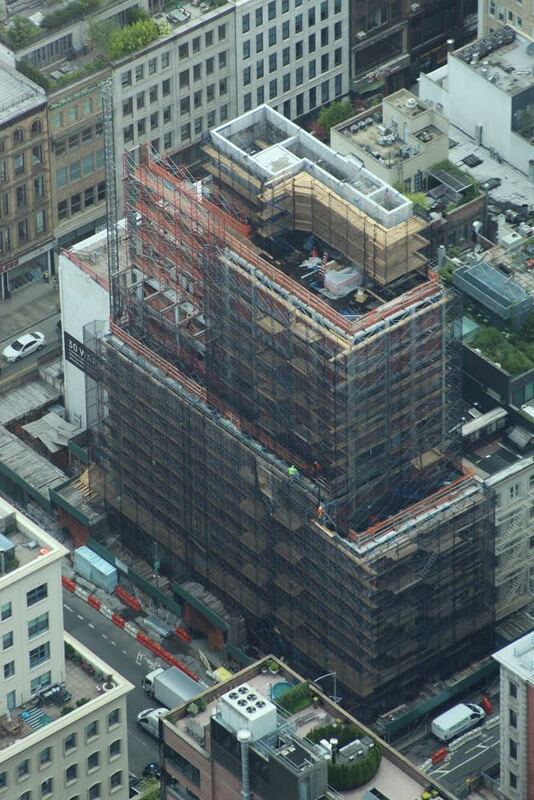 1 Comment on "30 Warren Street Topped-Out and Nearing Completion in Tribeca"
Please pardon me for using your space: Meet new name not Sebastian Morris. Thanks to Michael Young.